1) It will make space for more…. Just kidding! But it would help if it took up less space. So if I use it up without replenishing = more space! 2) It will challenge me to create within restrictions. From my experience, that is usually when I come up with the best and most creative ideas. 3) It will reinforce my “consume less” attitude that I already apply to other aspects of my life. So- will it be difficult? You bet! But I am willing to give it a try. I know 1 year is a long time, but I figured with the size of my stash it will definitely last me that long. Also, a caveat- gifts don’t count! (Haha you knew there had to be a loop hole!). 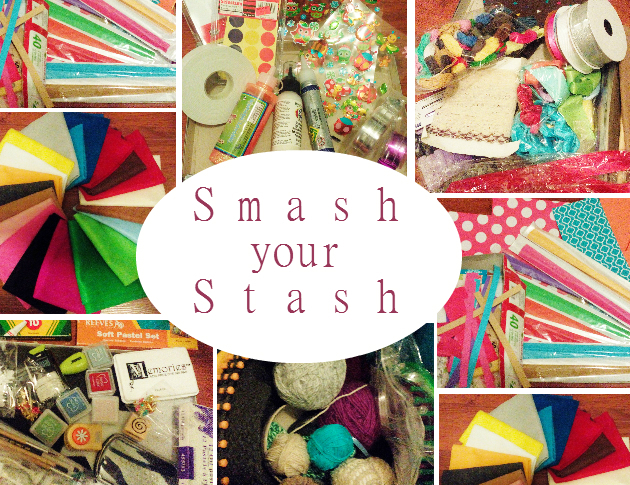 Feel free to tag along with me on this challenge, or share your experiences of working from your stash! Collecting vs. Hoarding- is your treasure really trash? One of the aspects of moving I always dread is decluttering, and taking a critical look at the mountains of STUFF, and think if this is really ALL worth hauling along. Let me be the first to admit- I am guilty of hanging on to ridiculous things with the thought that “This would be perfect in some abstract future situation”! But I think overall I keep this habit under control, restricting it mostly to craft supplies, and don’t get too attached to material possessions. This has been extremely important for me to do personally, as we mostly lived in small urban spaces with minimal storage. This, however, is not the case for Mrs. B, my mother-in-law. She takes pride in her treasure trove of useless things that are filling up her closet, garage, and crawl-space. As an example, she has amassed a collection of 5 baby gates. There is no current baby in her life, nor will there be any time soon, however on she goes to collect, like a squirrel at the first signs of fall. This problem is escalated by her inability to refuse “free stuff”. By this I mean whenever a neighbor, a friend, a relative, or a total stranger says to her- “I’m getting rid of this, do you want it?” her answer will always be a resounding YES. It doesn’t matter that she doesn’t actually NEED it right now, it doesn’t matter that its too big or heavy for her to carry home, it doesn’t matter that she has no use for it and even no space for it, she WILL take it. As we were moving, we were getting rid of some things, and as always asked her first “do you need it?” and yes, we know this is making it worse, but we really needed to get rid of stuff fast and we know she would say yes, so we did it anyways. As she was loading up her car full with our STUFF, she said: “you guys know all this stuff would end up back in your hands eventually? But I know what you would do with all my treasures, donate it all straight to the thrift store”. The absurdity of the situation still strikes me, she knows we would inherit her junk and have to deal with it again, yet she collects anyways. We jokingly refer to her as a “borderline-hoarder”, but choose to ignore the facts that we are not only contributing to the problem, but that it would come back to bite us in the end, and it would again be our turn to deal with the all the STUFF. She looks at it as treasure, and chooses to surround herself with it and enjoy each piece, yet appreciates the fact that it would be dumped as soon as it is in our hands again. Do you know a “borderline-hoarder” in your life? Do you collect “treasures” yourself? Where is the line drawn between collecting and hoarding? Leave a comment and let me know! Supplies: do I already have what it takes to make this? How much would it cost for tools and ingredients? Is this a material I have never worked with before? Time: How long would this take to make? Am I likely to finish it all in one go? Or will I start it and then forget abut it for a few months? Is now a good time for me to commit to a more serious project? 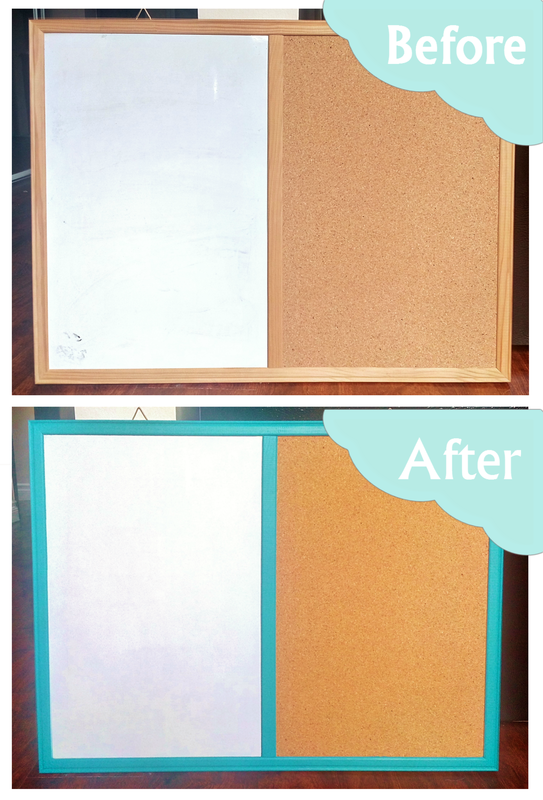 So go ahead, take on a project that has been sitting in one of your boards for a while, and make it your own! Take pride in fulfilling that original spark of inspiration and expressing your creativity. 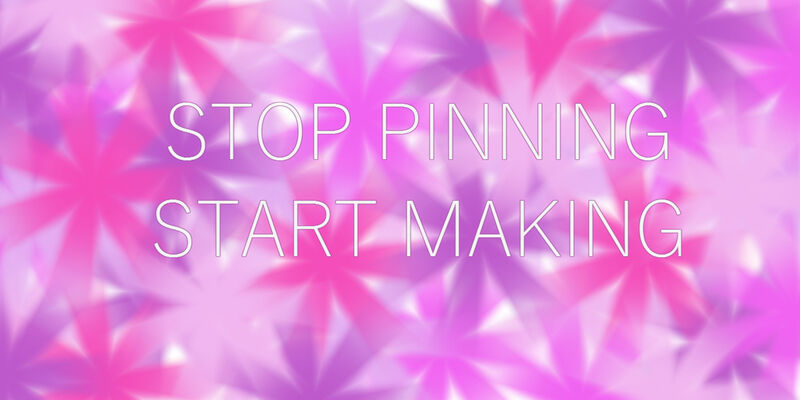 Got an inspiring Pinterest project to share? Leave a link in the comments, and I might just feel inspired and make it! A home office may not be a requirement for everyone, but for those of us who prefer a designated space for studying, catching up on paperwork, or even taking work home, it is essential. When putting together a home office, think about your specific needs. What is the space going to be used for? 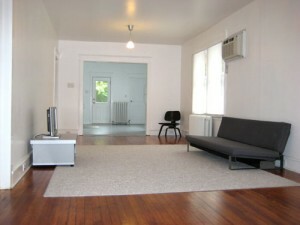 What are your must-haves for the space? How much time will you be spending in that space? 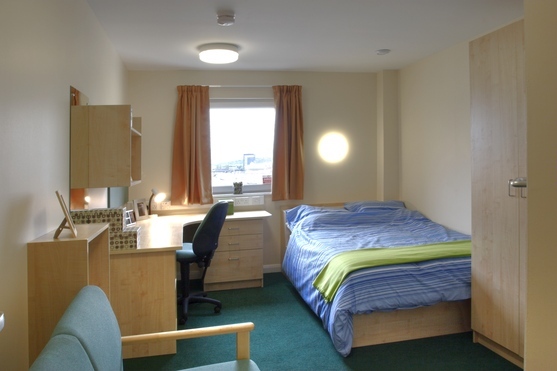 Lighting– if it is possible to have your work space near a window for natural light it is preferred. However, for some it is a distraction, or creates too much glare. Think about the optimal lighting you would need for the type of tasks done in the space. Is the general light in the room causing you to cast a shadow on the work-space? Consider adding a desk lamp for more focused task light. Ergonomics– this may not be at the top of your priorities, but if you are planning to spend a few hours a day in your home office space, it would be nice not to be sore afterwards. Make sure when seated your knees are at a 90 degree angle, and that your shoulders and elbows are not strained to reach for things like the keyboard or mouse. Storage– try and have your essentials within an arm’s reach. It is fine to store other items separately, but for increased productivity keep daily use items quickly accessible and frequently replenished as needed. The home office I am featuring next is mainly used for studying and doing work tasks on the computer. It needed to be functional and sleek at the same time, as well as keeping it within budget! The cork board / white board combo, pen cup, and stacking paper shelf were all purchased at the thrift store, for under $10 altogether. I decided to give the board a quick coat of paint (which I already had from a previous project) to inject some color into the space, as it would be rather monochrome otherwise. 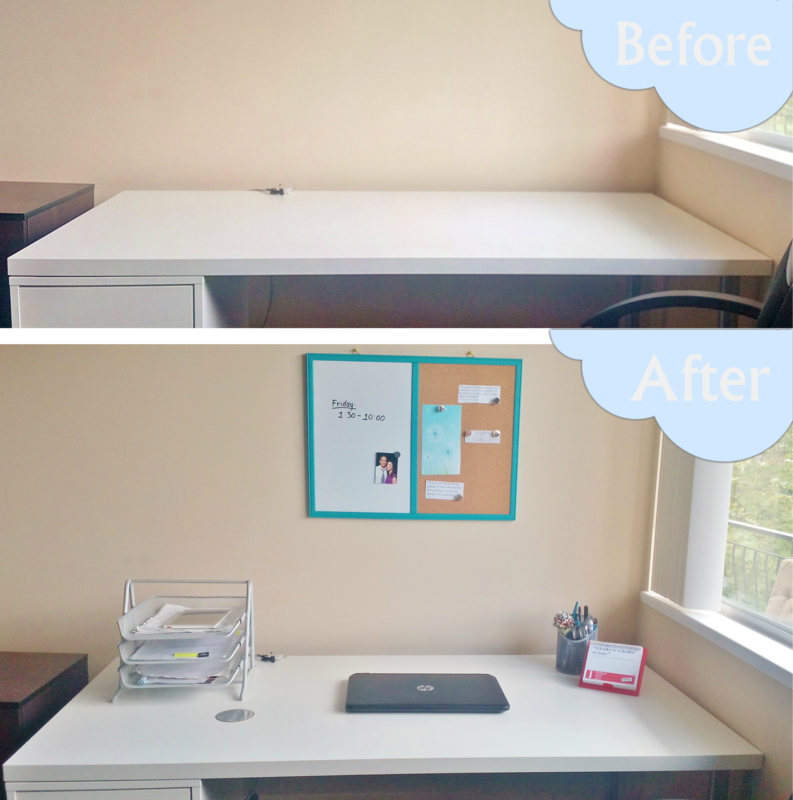 Let me know what you think, and what your home office must-haves are in the comments! Re-cycle, Re-use, Re-purpose: why buy new? 1) Budget– I simply cannot afford to splurge and go all out on craft supplies. 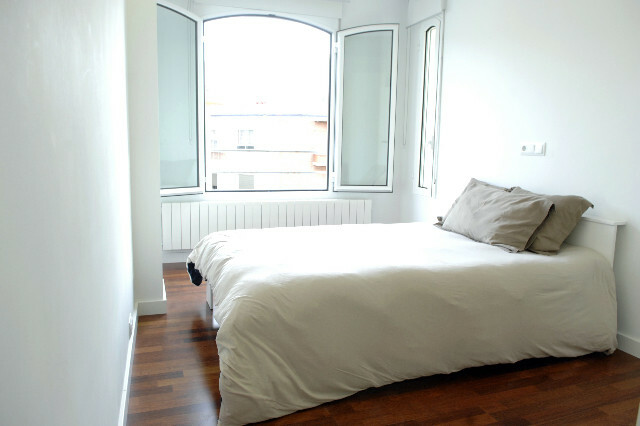 2) Space– I live in a small space so cannot afford the extra square footage to store all the STUFF. So how do I satisfy that craft craving without breaking the bank and qualifying as a clinical hoarder? Tea tins. I love tea and my family and friends know it so they always gift me tea, which usually comes in sturdy tins. A normal person might throw these out after their original purpose has been served, but I try and find ways to put this perfectly usable container to good use. Gift wrap. Yes, I am THAT person that tries to open their gifts carefully so that the beautiful paper it came wrapped in can be used another time. Same goes for ribbon, bows, tissue paper, and gift bags. I don’t usually re-use the paper to wrap a present though, but more to create paper-crafts or decorate other items around the house. Jars. This is an obvious one, as that is a pretty common item to re-use. Depending on the size, I use old food jars to store pens, hair accessories, homemade dry shampoo, and q-tips. These also make the perfect container / shaker for homemade salad dressing! In some cases, it is not enough to just use the things you have, and a little something extra is needed. For budget reasons, I try to purchase most of my additional project materials and supplies from either the dollar store, or a thrift store. You will be pleasantly surprised at the stuff you’ll find! 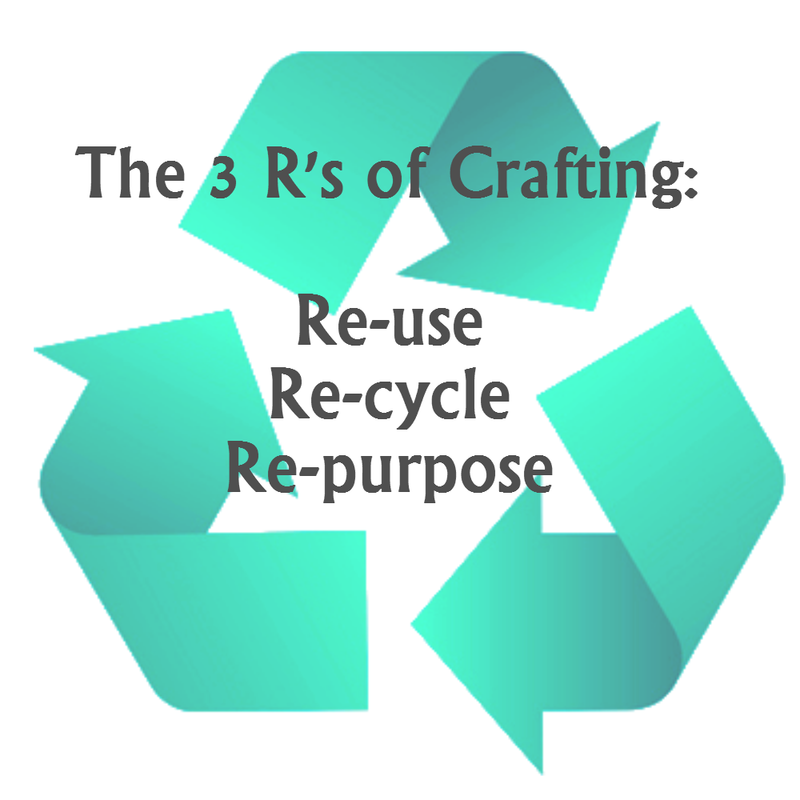 You will notice that the majority of the projects and DIY ideas features on this site are either re-used, re-cycled, or re-purposed in some way. That is because those types of projects inspire me the most: the challenge of creating something beautiful out of something ordinary. I hope my projects inspire you to re-think your space and the items within it, and make something awesome! To me, crafting is a lot more then just going to a craft store and loading up on expensive supplies that will only be used for one project. To me, crafting is the ultimate form of creativity: looking around you, recognizing a need, and figuring out how to make something to meet that need. When I was little I would stay in my room all day and make stuff. My parents refused to buy me a dollhouse so I made one. I felt like putting on a puppet show so I made a stage and puppets to match. I was going through a Harry Potter phase and made my own wands and ‘potions’. This trained my brain to look at the world through a creative lens, and when possible- make instead of buy. Many crafters latch on to one type of craft, for example: knitting, or card making. Unfortunately (or fortunately) that is not the case for me. I never pigeon-holed myself into one type of material, or one technique. Instead, I set out to passionately experience and learn as much as possible about EVERYTHING. I love making things out of paper, I know how to use a sewing machine, I can knit, I have some basic woodworking skills, I love painting, and a bunch of other things. The only downfall to being a multi-crafter is the size of the supply stash that comes with the territory! So finding creative ways to store and organize became a necessary skill too. I am not a selfish crafter either- I love making things for others who I know will appreciate it, and enjoy teaching others how to make stuff too. Many people have convinced themselves over time that they are not “artistic” or “creative”, but that’s not true! I believe that with enough encouragement and the right instruction anyone can become a confident crafter and maker. The best feeling for me is to start a project that requires very few supplies, finish it in a short time, and get to display it proudly. My favorite thing to hear is “you made that? !”- such an ego boost, I know! But it reaffirms why I craft- not only does it brings me joy, it also inspires those around me. That is why I am currently exploring ways to bring that joy and inspiration to my community, through creative classes and workshops. Stay tuned to hear more in future posts! 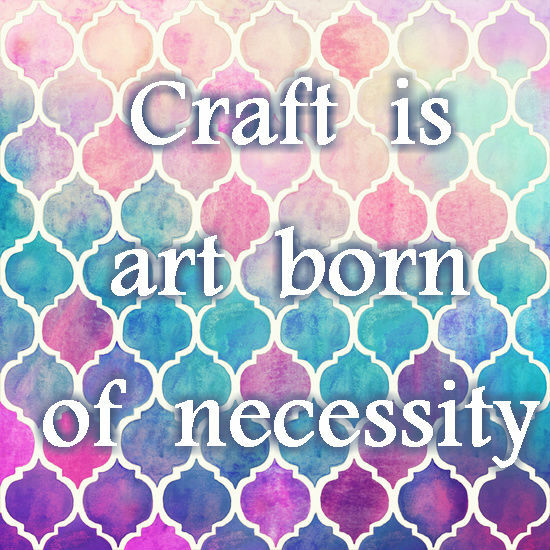 Why do you craft? I would love to hear your stories in the comments!